The Ely Stage Stop & Country Museum, operated by the Lake County Historical Society, will be closed Saturday, December 26, opening as usual on Sunday, December 27. The next monthly Fiddlers’ Jam will be held Sunday, January 3. Living History Days will resume in January on the 4th Saturday, January 23. The museum is located at 9921 Hwy 281 (Soda Bay Road) in Kelseyville (near Clearlake Riviera). Normal hours of operation are 11 a.m. to 3 p.m. each Saturday and Sunday, or by special appointment. Fiddlers’ Jams occur the first Sunday of every month from noon until 2 p.m. Living History events featuring local historians are held on the fourth Saturday of every month, again, from noon to 2 p.m.
Visit www.elystagestop.com or www.lakecountyhistory.org, check out the stage stop on Facebook at www.facebook.com/elystagestop, or call the museum at 707-533-9990. Contact the museum for questions about volunteer work, donations of old wood for barn construction, or docent applications. Make a New Year’s resolution to get involved! Santa with Pete Chappars and Steve Hendricks at the Ely Christmas Marketplace last Saturday. Pete and Steve were the organizers of the event which drew big crowds. 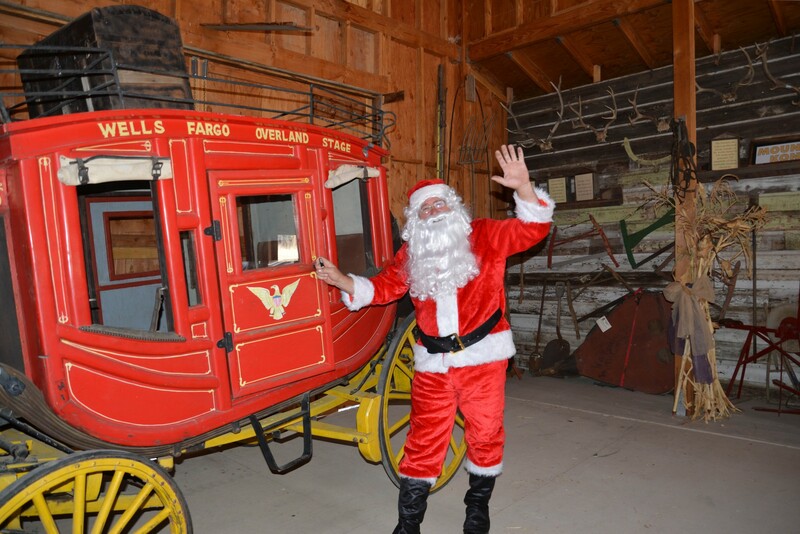 Shopping, hay rides, and moments with Santa were enjoyed by all, young and old. Photo by Greg Blinn. On November 19, eighty third-graders from the Kelseyville Elementary School visited the Ely Stage Stop & Country Museum for a morning of living-history demonstrations. Museum docents provided eight stations of various activities through which groups of ten students rotated to get a better idea of how life was in the old days. Demonstrations at the main house included clothes-washing by hand using vintage equipment, operating an antique corn sheller, a display and discussion of Lake County’s early dairy industry, the antique phone system that connects the Ely main house with the barn, and how the antique wood stove would have been used in an old time cook house. Demonstrations in the barn included the handling of pioneer cookware, a discussion of the resident stage coach replica, and a display and hands-on opportunity to learn about horse tack from cowboy days. Outside, on the Ely grounds, the groups got to see an antique engine in operation and also got the opportunity to hop on a San Francisco cable car from the 1800’s. Sheyla….I did not know that people had to boil water just to take a bath. Madison….Wow, I did not know that the stage coach was pulled by 6 or 8 horses. Omar….I learned that old times are pretty cool, but pretty hard, too. Manny….Now I know how hard it is to be a mom! Julian….When I go back to the Stage Stop I will explore, learn and see new stuff. Located near Kelseyville, the Ely Stage Stop dates back to the 1860s and, over the years, served as a stagecoach stop, hotel, post office, general store, and at one point, even a gas station before taking on its current role as a historical and community center. The museum strives to collect the stories of early Lake County. Visits by school children and other interested groups prove the value of preserving the history of Lake County and sharing it with County residents and visitors. The Lake County Historical Society’s Ely Stage Stop & Country Museum is located at 9921 Hwy 281 (Soda Bay Road) in Kelseyville. Current hours of operation are 11:00 a.m. to 3:00 p.m. each Saturday and Sunday or by special appointment. Visit www.elystagestop.com or www.lakecountyhistory.org, check out the stage stop on Facebook at www.facebook.com/elystagestop, or call the museum at 707-533-9990. Docents in the Ely barn giving old-time demonstrations to Kelseyville Elementary Third-graders during a November field trip. These three groups got to handle pioneer cookware, learn about the stage coach days, and were given a hands-on opportunity with horse tack from cowboy days. Photo by Greg Blinn. 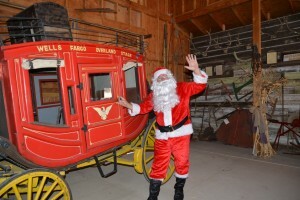 Come and enjoy the “decked halls” at the Ely Stage Stop & Country Museum for a Christmas Marketplace featuring local artists selling their handcrafted goods in the barn on December 19 from 10 a.m. to 3 p.m. Santa has promised to be at the event and will be roaming the grounds and joining hayrides with the kids, weather permitting. Bring your cameras as Santa will be available for photos with kids of all ages at the museum’s main house. Handcrafted goods will include jewelry, bath and beauty products, butcher blocks, up-cycled fabrics, wood creations, photography, and more. The last Ely Marketplace was held on the 4th of October in conjunction with the Fiddlers’ Jam, with all donations given to the Lake County Wildfire Relief Fund created by North Coast Opportunities (NCO) and Mendo Lake Credit Union (MLCU). The October event was attended by several hundred people. This December event will help promote the growth of the Ely Stage Stop Blacksmith Shop and further the interaction of the local community with the history of Lake County and the Ely Stage Stop. Join the museum volunteers and docents for a fun-filled day on the museum grounds with Santa. Pick up that perfect last minute holiday gift and support Lake County artists. Santa checking out the Ely Barn. He promises to be at the Ely Christmas Marketplace on Saturday, December 19. Photo by Greg Blinn.